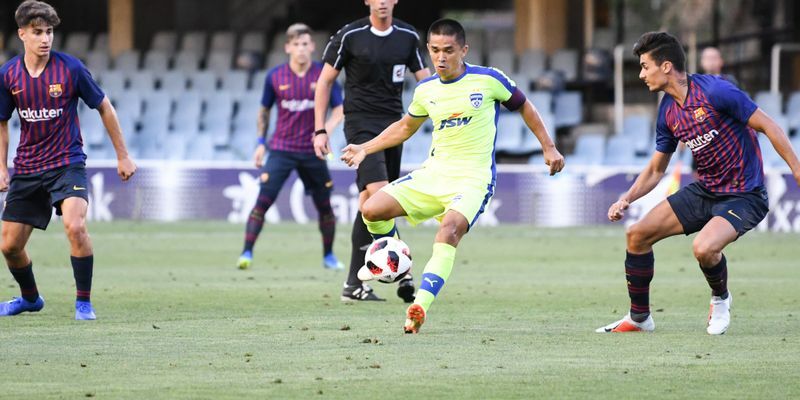 Bengaluru FC concluded their pre season Spanish tour with a 3-0 loss to Barcelona B at the Mini Estadi in Barcelona yesterday. Bengaluru created openings throughout the match but a goal from Monchu and a Carles Perez brace were enough to see the Spanish side take the honours for the day. It was the proverbial game of two halves as the Blues opted to be cautious in the opening exchanges. With Barcelona B seamless in attack, Bengaluru were compact in shape and tight in defence to thwart any possible danger. Working hard off the ball, the Blues finally managed to create successive chances around the 20th minute. Miku who created space in the box after being fed by Sunil Chhetri managed a good attempt on target but was denied by Ezkieta. Moments later, it was the skipper who went close firing his left volley just wide of the vertical. The second half was a different story, with the hosts upping their game. Quick passes in the final third caught the Blues’ defence off guard as Barcelona B went 2-0 up in seven minutes around the hour-mark. Monchu broke the deadlock in the 55th minute with a cracker from distance before Carles Perez doubled the advantage with a finish from a narrow angle from the left in the 62nd minute. Ten minutes later, Perez (73rd) got his second with another finish from the left as the home side capitalized on a fatigued backline. Carles Cuadrat rung in a few changes bringing in Rino Anto, Gursimrat Singh, Bidyananda Singh and Chencho Gyeltshen in the final quarter as the Blues pushed forward. While a few half chances fell for Bengaluru, Barcelona B managed to see out the game 3-0. While the Blues played four friendly games in Spain, Cudarat utilized a total of twenty-three travelling players. Bengaluru who netted twice in the opening two games were forced into a defensive game in the clashes against Villarreal B and Barcelona B. The Blues who land in Bengaluru on Thursday, will host Turkmenistan’s Altyn Asyr FK in the first leg of the 2018 AFC Cup Inter-Zone semifinal at the Sree Kanteerava Stadium on August 22.